This winter I didn’t get out as much as I should have, but when I did I found some beauty. 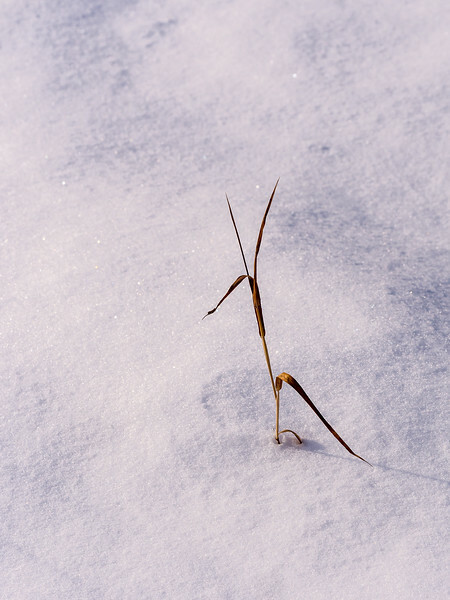 Seems that for me when I’m out in winter I go after 1 of 2 things – small slices and abstracts or landscapes. This is a slice and abstract post, mostly done with the Lumix 35-100mm f2.8 telephoto zoom. It’s a compact lens with a fixed aperture, which I don’t really need in winter, but is very useful in less bright light. 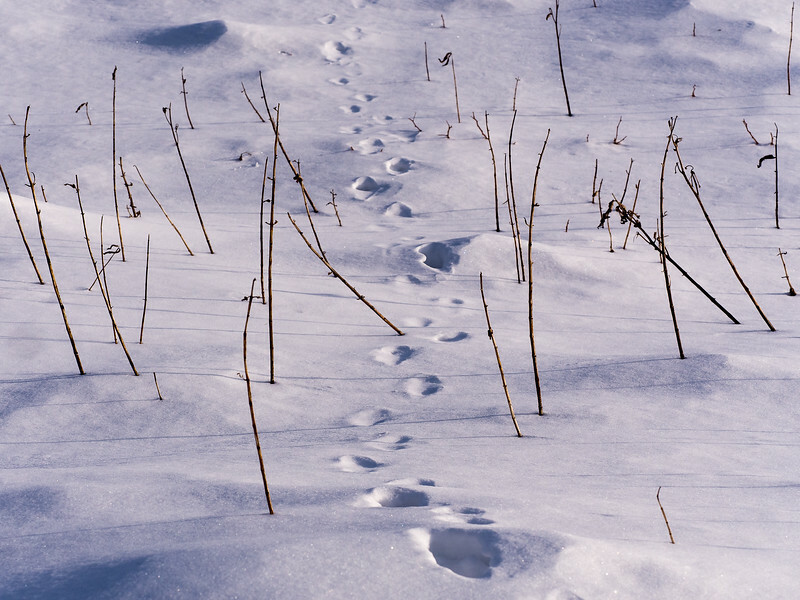 Critter tracks are one thing about winter that I love. 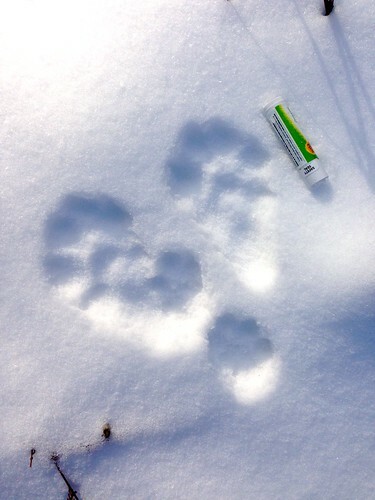 Sure, critters are always trekking somewhere, but only in snow can we see the evidence. And they make for great subjects. 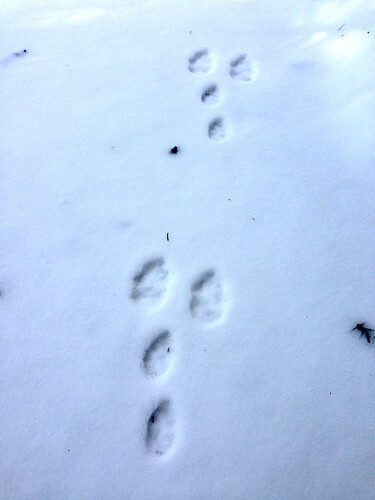 This first one is a coyote. I’d been following them along a road beside a dam spillway when it turned up the slope to the top of the earthworks. 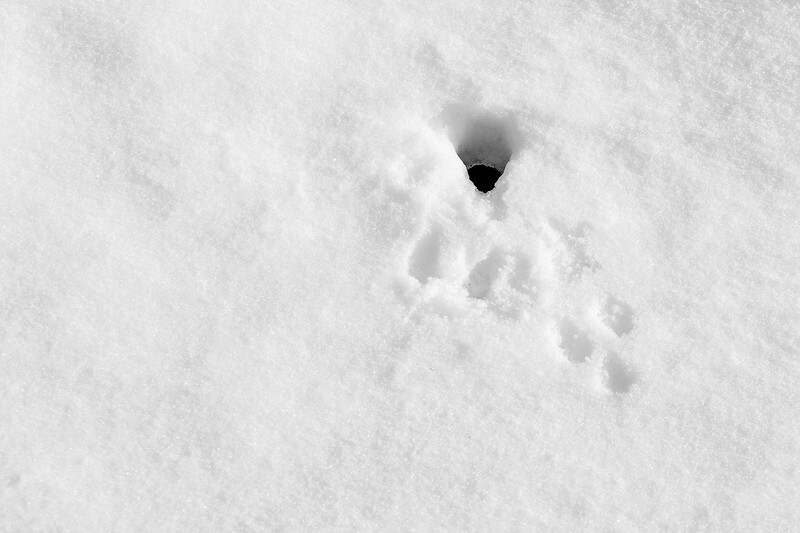 Little critter tracks are harder to photograph sometimes, but I keep trying. I think this was a mouse or vole that came out of its den, took a quick look, then decided it wasn’t worth it and went back in. At least that’s the story I’m trying to tell. I’m not sure it works because it’s so small and there isn’t much dynamic range in terms of black and white, but I keep experimenting. 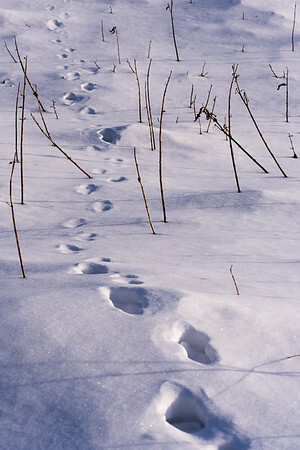 Sadly I didn’t see any bunnies, but now I know they are just downstream of me on the banks of the same river I live on. We’re neighbors. Oh and no wonder the eagles love it here. Surf and turf! By now you’ve probably noticed that we don’t have a lot of white snow here in Wisconsin. Not quite true and I wasn’t really cheating. Snow will take on the color of anything it reflects – the sky, trees, sunlight, your jacket – anything. The trick is to use that to enhance whatever look you’re going for in your images. If you want a stark black and white presentation, or a softer, pastel-shaded shot you can do that by managing the HSL panel and white balance. The quality of light is going to determine what you get in camera and you can emphasize it with post-processing. White balance will do a lot of it, but pay attention to the color cast slider that goes from green to magenta. I just nudged that to the magenta side a bit and got the feel I wanted for both the grass image and the coyote prints. The mouse house track shot was the same day and I used a monochrome image to isolate the hole and the tracks more than a color shot would have done. With the phone it’s harder since I don’t use any post-processing software for those. I try to get the exposure right in the camera which is tougher, but can be done by getting it to meter on something that is more neutral gray, thus rendering the snow a brighter white. In a real camera I typically overexpose 2/3 to 1 1/2 stops over for snow shots. I usually let the camera set white balance, but sometimes I change that to match what my eyes see. It gives me a frame of reference for when I start messing with the image in Lightroom.